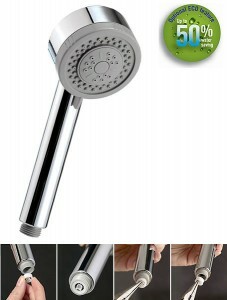 Tapstore.com have launched nine new water saving showers handsets as part of their Eco products ranges, They range from a simple single function handset to a four function shower handset. “The idea behind these ecologically friendly products is to save water with style”Say’s Paul Smart director of Tapstore, “We have looked at the current products on the market and there is very little choice and what choice there is out there looks awful”. So here we have a modern stylish range and I must agree that it is certainly not what we are used to from the water saving ranges that we are used too, these would look very good in any modern bathroom. The Tec water saving shower handset (left) is a three function shower handset giving saturating, massage and saturating & massage settings all this for just £16.00, The Contour maxi water saving shower handset (right) is another handset from the range that is a four function shower handset giving saturating, massage, saturating & massage and bubbling for £25.00, all of the shower handset come with rub clean jets and are made from high quality materials. This entry was posted in Water Saving Devices, Water Saving Showers and tagged bubbling, eco, eco products, ecologically friendly products, four function, handset, jets, massage, modern, saturating, shower, shower handsets, showers, single function, stylish range, tapstore.com, three function, water saving. Bookmark the permalink. ← Part G Regulations delayed.